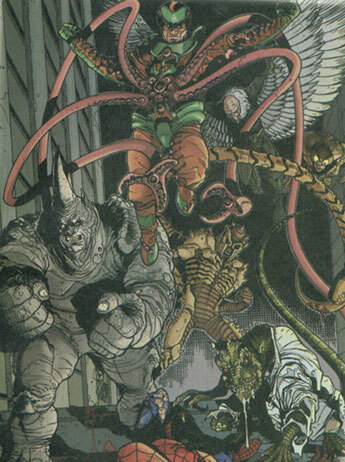 History: (Marvel Universe Millennial Visions 2001 - "Sinister Six: Death of the Spider" (fb) - BTS) - In February of 2003, the members of the Sinister Six joined with Rhino, Scorpion, and Carnage (forming the "Noxious Nine") to take out the Blin Quay Nuclear Power Station in Brooklyn, New York. While the confrontation resulted in the deaths of the Sandman, Mysterio, and Electro, Carnage was atomized in a containment field that caused an overload, releasing radiation throughout the plant. 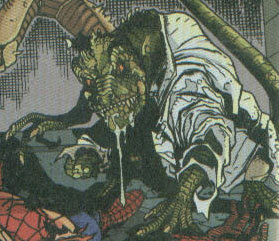 (Marvel Universe Millennial Visions 2001 - "Sinister Six: Death of the Spider (fb) - BTS) - In the weeks that followed, the remaining members of the Noxious Nine discovered that the radiation had fused their genetic material to that of their costumes, transforming them into their animalistic namesakes. 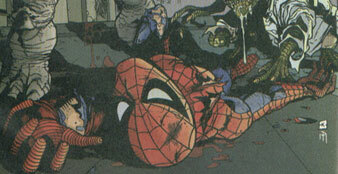 (Marvel Universe Millennial Visions 2001 - "Sinister Six: Death of the Spider") - On May 23, 2004, the remaining six of the Noxious Nine took out Spider-Man using their newfound animal-like abilities, apparently killing him. Comments: Created by Kilian Plunkett. 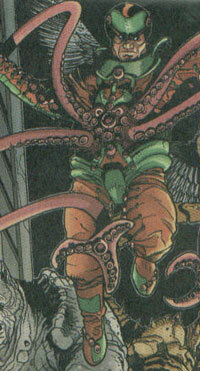 Doctor Octopus was the same as his Earth-616 counterpart up until he participated in the attack on Blin Quay Nuclear Power Station and became irradiated, fusing his costume to his genetic material. The fusion transformed his mechanical arms into that of a real octopus's arms. --Marvel Universe Millennial Visions 2001 - "Sinister Six: Death of the Spider"
Frog-Man appeared to be the same as his Earth-616 counterparts up until radiation from the Blin Quay overload transformed into a frog-like humanoid capable of superhuman leaping and breathing underwater. Lizard was the same as his Earth-616 counterpart until the radioactive fallout from the Blin Quay overload permanently transformed him into his Lizard persona. 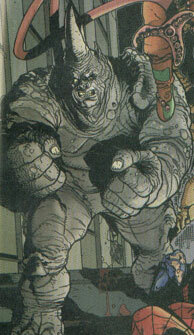 Rhino was exactly the same as his Earth-616 counterpart until he was irradiated at the Blin Quay Power Station. The radiation caused his costume to bond with him genetically, transforming him into more rhino than human. 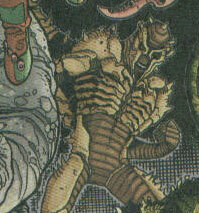 Scorpion was the same as his Earth-616 counterpart until the Blin Quay Power Station radiation bonded his costume to him genetically, transforming him into a humanoid scorpion on a genetic level. Spider-Man was the same as his Earth-616 counterpart up until the now-animalistic Noxious Nine tracked him down and killed him. 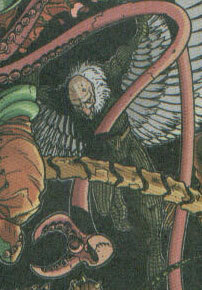 Vulture was the same as his Earth-616 counterpart until the radiation from the Blin Quay overload transformed him into a humanoid vulture.